In Boat Modeling with Dynamite Payson, the well-known author/boatbuilder applies his "instant approach" to building tabletop replicas of small rowing and sailing craft suitable for the mantel, mud puddles, or just dreaming. He starts with a simple lobsterboat anyone can build in an hour and progresses through dories, skiffs, catboats, and peapods-there's even a Friendship sloop and a sardine carrier. Dynamite's friendly, no-nonsense instructions and step-by-step photographs, coupled with marine artist Doug Alvord's beautiful drawings, guide the reader through each boat's construction, from stem to stern. 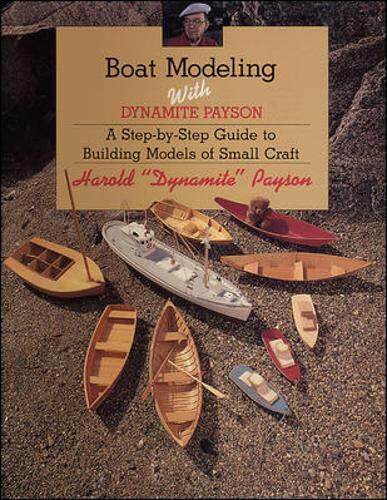 The only modeling book written by a real Maine boatbuilder, Dynamite Payson will feed the fantasies and hone the skills of armchair sailors of all ages and degrees of competence, whether as a warm-up to a full-size boatbuilding project, or as an end in itself. Perhaps America's (if not the world's) best-known writer on the building of small boats, Harold H. "Dynamite" Payson has been a lobsterman off his native Maine coast; a professional builder of plank-on-frame boats; an innovator and teacher of modern plywood boat construction; and a tireless and infectiously enthusiastic author, whose many magazine articles and books have inspired the building of more small boats than you could begin to count. Voted by the readers of Small Boat Journal to the Small Boat Hall of Fame, Dynamite is also the author of Boat Modeling the Easy Way, which delves into the lift method of modeling.